I love Chik-Fil-A. I wish we had one in our area! If I could go there every week, I would. I scoured Chik-Fil-A's ingredient list on their nutrition brochure and the Internet for some recipes. I think I am really, really, really close. Imitation is the sincerest form of flattery, don't you think? I found Janet's recipe on Allrecipes.com and a couple of copy cat recipes that called for Season All. The Chik-Fil-A brochure ingredient list had all the ingredients I had on hand...there was a 'tomato powder' listed and I decided to try Knorr's Caldo de Tomato... which is a combo of chicken bouillon and tomato, and came up with my own recipe. I use Knorr's Caldo de Tomato in many of my Mexican recipes: Tacquitos, Chicken Enchiladas, Tamales, Cheese Enchiladas, and Mexican Rice. I am sharing it with you! Making your own bread crumbs is VERY easy! First, you need to use bread that has a low or no sugar content, such as french bread. Why? 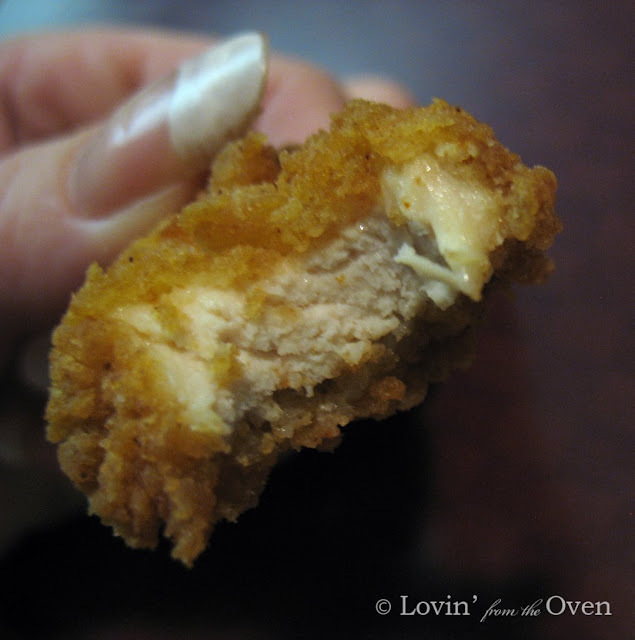 Because when frying with a bread coating, your breading will brown more quickly, even before your chicken is done. That is what happened with my first batch. Anyway, back to making your own bread crumbs. Just take your bread, break it up and bake it at 350 degrees until dry...usually about 12 minutes. Then dump them in your food processor or blender and chop them up fine. The second thing I learned is that my chicken needed to be cut into small pieces, 1" cubes, in order to cook all the way through before the breading gets too brown. The last thing I learned was: double dipping is good. The 2 nuggets on the left were single dipped. The 3 nuggets on the right were double dipped. What's double dipping, you ask? That is when you dip your chicken in the egg mixture, then into the flour/breading, and BACK into the egg mixture, then flour/breading mix. This makes a crispier nugget. It looks like Chik-Fil-A double dips their patties and only single dips their nuggets. I like double dipping. It is so worth it! Mix buttermilk, tomato bouillon, sugar, garlic and onion powders and paprika in a large container with lid. Cut up chicken and place in buttermilk mixture. Allow to marinate in fridge overnight or for at least 4 hours. Combine flour, bread crumbs, baking soda, onion and garlic powders and paprika. Stir well. In a separate bowl, beat one egg. Take about half of the milk marinade from the chicken and mix it with the egg. Dip small batches of chicken pieces into egg mixture and coat well with breading. 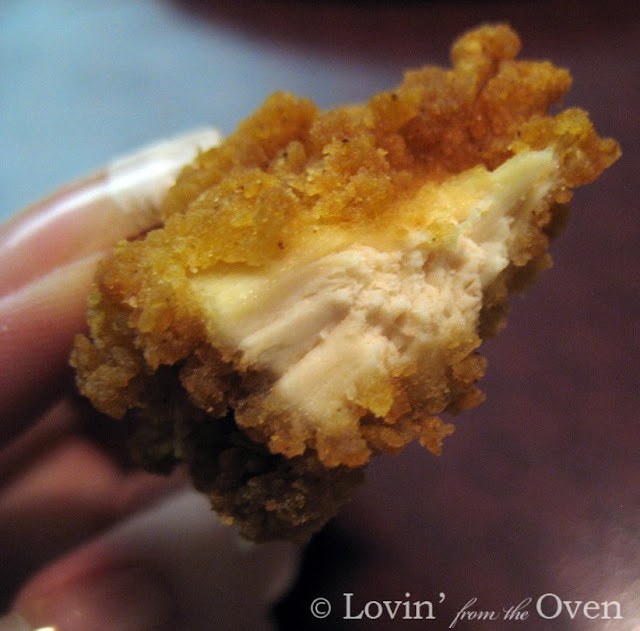 If desired, dip chicken pieces in milk mixture again and back into the breading for a crispier nugget. Fry in small batches in 375° oil for 1-1 ½ min. Can use a saucepan with 2" of oil for frying. Serve with honey mustard sauce or desired dipping sauces. Readers who have tried this recipe and loved it! You have a great looking blog with some great recipes! Thanks for adding me on FB and I DID go find your snowflake cookies - very pretty! I look forward to reading your blog over! I am soooo going to try these, they look fantastic. Chik-fil-a nuggets are a weakness of mine. I am so excited to try this. There are no Chik-Fil-A's any where near my place. Thanks so much. I work at Chick-fil-A, and that isn't exactly how we cook our food. We do use a pressure cooker, but with peanut oil instead of water. The chicken fillets are laid on racks within the cooker to help them cook more thoroughly, which is why our fillets are never flat. Nothing is double-dipped either. 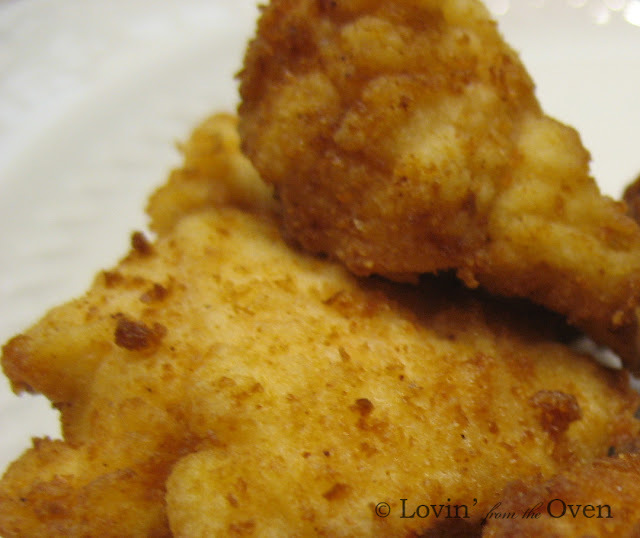 The nuggets appear to have less breading because they are cooked in a basket within the pressure cooker, so the breading often falls away when we stir and shake the nuggets. Hope this helps. We made these tonight and they are absolutely amazing! Yum Yum! Thanks Frieda! Made these last night, followed the recipe word for word and am impressed with the result. I want to do a side by side taste test verify some thoughts I have to tweak the recipe just a bit. There is no salt except what is in the Caldo de Tomato. I am thinking 1/2 tsp in the egg wash and 1/2 in the breading. Not to taste the salt, but to pop the other flavors. Perhaps a Tbl of powdered sugar in the egg wash to sweeten just a touch. I would also likely use Panko bread crumbs (for uniformity in size and ease of use). After breading allow pieces to rest on a rack for 15 minutes to dry and allow the breading to set, less will fall off into the grease. Cook in oil til the color is right, drain on a wire rack in a 1/2 sheet pan, and finish in oven (after all frying is done) at 325 for 10 minutes or so to be sure chicken is cooked properly. Anonymous, thanks for the review! 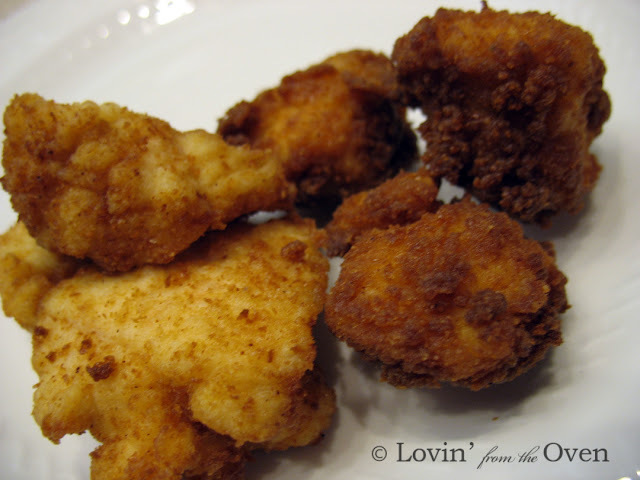 If you want to do a side by side with the original Chick fil A nuggets, you will find that my recipe is quite close. Yes, salt will pop the other flavors and keep in mind that my recipe does contain some sugar. Panko crumbs are a great alternative to breading, as they will absorb less oil and be crispier than a traditional breaded nugget. CFA does not use panko crumbs, but you may find that you prefer panko to the bread crumbs. Good luck and enjoy! So if I understand correctly, you're cooking these in a regular fryer? Not a pressure-fryer or a pressure cooker? Thanks, love the site Frieda! mySavioReigns: Yes, I cook these in a regular fryer. You can heat up 2" of oil in a skillet and fry these. Click on the recipe link at the end of the post for ingredients and directions ~ Enjoy! Yum, I crave these all the time! I think the biggest thing you forgot to include, was that you need to fry them in peanut oil...Chik-Fil-A only uses peanut oil and that's was gives them that awesome taste! I am fairly sure CFA only uses egg whites now, not whole eggs in their batter. Might give that a try.